Invigorate Your Smile With High-Quality Porcelain! Over the years, tooth enamel can become significantly damaged, even if there is technically no tooth decay present. Of course, cosmetic and structural damage to teeth only makes it more difficult for you to show off your smile to those around you. Instead of settling for chipped and stained teeth, porcelain veneers boost your confidence and restore your teeth back to their original youthful state. Learn how Dr. Hornstein and his team crafts your new smile and hides your imperfections with traditional porcelain veneers and Lumineers! The process of fabricating porcelain veneers has evolved into a conservative process which typically takes two appointments. 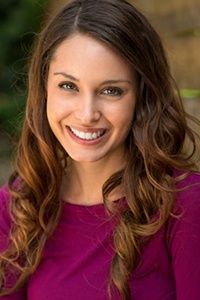 During the initial consultation, Dr. Hornstein will listen to your concerns and help guide you through the process of restoring your smile to your specific goals. A comprehensive exam and smile analysis is essential in achieving your successful results. Therefore, Dr. Hornstein will gather as much information as possible to make this transformation seamless. Before any work is started, the CFAD team will carefully take a mold of your existing teeth. Our artists will make any suggested modifications to your existing teeth using these set of molds. We will use wax to change your smile based on your feedback and the strict esthetic guidelines we employ. The final wax configuration will be reviewed with you prior to starting your smile transformation. This way we can show you the final results prior to starting the work! Once we have your approval, we will use this new “mock up” as our blueprint to be the final phase of your new beautiful smile. Since the evolution of veneers in 1997, most of the time we can implement no preparation or minimal preparation veneers. While the final veneers are being created, provisional veneers identical to the final veneers will be fabricated and placed on your original teeth. In approximately 2 weeks, your final veneers will be bonded onto your teeth and your life-changing transformation will be complete. Afterwards, our team will help you learn how to care for your new smile. Porcelain veneers are one of the most comprehensive and conservative solutions to damaged teeth caused by trauma, cracks, chips or permanent discoloration. Veneers can even address spaces and misaligned teeth, so these are another alternative to orthodontics to improve your smile’s appearance. Furthermore, porcelain is durable, long-lasting, natural-looking and restores the strength of your tooth enamel. It even reflects and refracts light almost identically to natural teeth. Porcelain veneers are ideal for anyone with multiple cosmetic imperfections in their smile. It is most ideal for those who want to solve multiple issues with a single treatment, helping them save money on multiple cosmetic options they would need to complete to achieve the smile they are looking for. In some cases, our office may recommend minimal-prep veneers for those who either do not want to remove existing tooth structure or simply do not need to. Lumineers are even thinner than traditional veneers and as a result, require little to zero removal of existing tooth structure to place. Lumineers are ideal as a less invasive procedure, but traditional veneers are better for those looking for a fully-customizable design for their new smile. Dr. Hornstein will provide his professional recommendation and work with you to achieve a smile you are proud to share. Experience the Beautiful Transformation That Holistic Dentistry Can Offer! To learn more about treatment, please call our Beechwood dental office to schedule an appointment. We serve those living in Cleveland, Solon, Shaker Heights, Pepper Pike and the surrounding areas. Take a moment to review important information on our new patient page. If you are considering a smile makeover via porcelain veneers but have other questions you would like to address, consider our most frequently asked questions on the topic. In it, you will find relevant information on the treatment process, aftercare and more! Will My Veneers Look Fake? When crafted by a professional, porcelain veneers are designed to look anything but fake or unnatural. We accomplish this by carefully crafting every detail, including their shape, size and color, to match your current smile. We use porcelain because of how closely it mimics and reflects light compared to natural tooth enamel. Our techniques ensure that your smile looks incredibly natural and beautiful after placement. If you are not happy with your results, we’ll make adjustments as needed. Can My Veneers Become Stained? Porcelain is naturally stain-resistant, which is in large part why dentists use it to create dental veneers. This means you can enjoy richly-pigmentated food and beverages without worry of your veneers staining, including wine, tea and coffee. However, if your veneers do become scratched, it can make them more susceptible to staining. Keep in mind that enamel carries many micro scratches for stains to seep into, while porcelain is quite naturally smooth. Porcelain is not considered an organic material. This means that organisms, like the bacteria found in plaque acids, cannot break down inorganic materials, including porcelain. Since the veneer is bonded directly to your natural tooth, it largely protects that front-facing area of the tooth from decay as well. However, you should still practice daily brushing and flossing to remove any and all possibility of your tooth developing a cavity. After all, porcelain veneers are not crowns and do not cover the surface behind the veneer. Prior to removing any tooth structure, Dr. Hornstein will administer a local anesthetic to numb the tooth and surrounding gum tissue. This will remove any discomfort and should reassure you of a comfortable treatment. Of course, this can be avoided if you opt for Lumineers, which generally do not require removal of tooth structure to place. In rare cases, minor discomfort can be felt, but this is a normal side effect for some patients. What Aftercare Should I Expect? 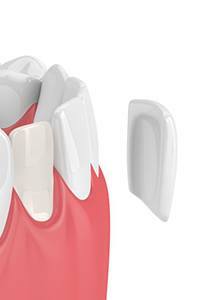 Caring for your porcelain veneers is very similar to how you would care for your natural teeth. This means you should be brushing twice a day with fluoridated toothpaste and flossing daily. Make sure to floss around the sides of the veneer to prevent plaque buildup. Those who want to keep their smile as white as possible should avoid smoking or using tobacco products of any kind. Visit our office once every six months to confirm the condition of your veneers and whether or not they need replacing.